Calibrate up to 1,000 samples or just 3? Depending on the sample, NIR systems can require anywhere from 10 to 1,000 samples to calibrate the system. This is due to the fact that NIR (near infrared) technology uses a beam of light to measure qualities on the surface of a sample. Typically, NIR units are calibrated by using samples with known, but varying, levels of moisture and fat. The analyzer records the patterns of light reflected from these samples and a computer “model” is generated for that particular type of sample. After these standards are calibrated, samples placed in the system have their patterns of reflectance compared to the standards. 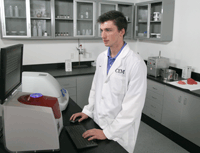 The computer then predicts what the fat and moisture should be based on the sample’s “resemblance” to the samples originally used to calibrate the system. CEM’s MEAT Trac utilizes NMR; the same technique used in medicine is called an MRI. Just as doctors can see what is happening inside your body more clearly from viewing an MRI scan than just by looking at you, MEAT Trac can give you greater accuracy than NIR. The MEAT Trac uses a magnetic pulse to measure fat and moisture throughout the sample, not just on the surface, providing results that are more accurate. Unlike NIR systems, changes in the color or texture of a sample do not affect the system’s results. With only three samples needed to calibrate a method, you will be on your way to optimizing your process fast. Standard NIR systems require validation and calibration maintenance, which can be quite expensive because they require anywhere from 10 to 1,000 samples to calibrate the system. Once created, calibrations on the MEAT Trac are set for the life of the system and they are robust enough to stand up to reformulations. No recalibration needed! Based on calibration maintenance and monthly validation (as recommended by the system manufacturer), the cost over time of the MEAT Trac is substantially lower than other competitive systems. 1 Values for MEAT Trac determined using AOAC methods; data reported by MEAT Trac System.